She was just 18 and was going to church on a Sunday. Wearing a traditional wraparound dress she took a rickshaw.Suddenly the rickshaw puller caught her hand and tried to molest her.A kick and a punch later he was lying flat on the ground.The girl had saved herself.And destiny had played its card to give India its future Boxing World Champion – MC Mary Kom aka Magnificent Mary! Born in a poor tribal family of Manipur, Mangte Chungneijang (MC) took up boxing after Dingko Singh’s gold at the 1998 Asian Games and adopted the name Mary (her deep faith in God) & Kom (tribal title).Practising punches late into the night, her goal was simple: to lift her family out of poverty and live up to her name. Women’s boxing had not come off age in India in the 1990s & early 2000 when Mary took up the sport.From fighting poverty,facing her father’s ire for making an unconventional choice to over coming her disadvantage of height and reach she braved it all and eventually came out on top.Mary was a multiple World Champion by 2006.Mary then gave birth to twin boys and took a two year break to raise them.Against all odds she once again won the AIBA Women’s World Boxing Championships in 2008 & 2010 and a Bronze at the 2010 Guangzhou Asian Games. Now the five time World Champion set her eyes on an Olympic berth and was the lone Indian woman boxer for the London Olympics 2012 where the sport was making its debut.Mary Kom won the Bronze and was the lone Indian boxer to win a medal.The fact that she was a mother of two only enhanced her reputation and people recognised the sacrifices the “super mom” had had to make to achieve her dreams. Amul commemorated the feat with a fitting and odious ad depicting Mary Kom’s medal winning feat and her twins shown playing with the medal. Taking a break and giving birth to her third child Mary soon went off the boxing map.In 2014 the sport made its debut at the Glasgow Common Wealth Games (CWG) and making a comeback Mary lost to Pinky Jangra in the trials who went on to win the Bronze at Glasgow. The daggers were out and the critics had written off Mary and some had even grudged her for promoting the biopic ‘Mary Kom’.In the final round of the 2014 Incheon Asian Games trials “the comeback girl ” once again fought Pinky Jangra.And Won!And the rest is history. At Incheon Mary won the first ever Gold medal for an Indian women boxer at the Asian Games in a closely fought Fly Weight final. The legend of Mary Kom just got bigger- the Super Mom had now become the Unbreakable Wonder Woman. This is where I come in with some hard facts. A word of caution for the boyfriends of the MC Mary Kom Boxing Academy graduates- while on a date please carry head guard, gum shields, abdominal guard for the family jewels, insurance papers and a slip giving out whom to inform if found knocked out! And yes maintain distance- outside hooking range-when getting too mushy! Amitabh Bachchan (Big B) will now need to be approached for re-shooting the famous song “Mere Angne Mein Tumhara Kya Kaam Hai” which extols the virtue of various kinds of wives – “Jiski Biwi Lambi,.Patli..Choti…” (tall,slim,short) – to add “Jiski Biwi Boxer…. uska kamre mein kya kaam hai”- obviously its better to sleep in another room than getting punched for snoring or for changing the TV channel without warning! Infact with a “Boxer” wife most in-laws related issues are also likely to be resolved “amicably”. I was wondering that its a good way to resolve political rivalries too.Boxing requires same height -weight opponents.So the line up for the marquee fights in the Indian Pollitics Boxing League for Women could be Jayalalita versus Mayawati, Sushma Swaraj versus Mamata Di, Uma Bharti versus Vasundhra Raje & Sonia Gandhi versus Aambika Soni. Since Jayalalitha is jailed she can be matched up with Om Prakash Chautala as well (Learning of the prospect Mr Chautala immediately sought bail). For same “political corner” opponents, Arvind Kejriwal shall refer the bout , this way the opponents can atleast punch the referee and avoid a no contest! And to resolve disputes the adjudicator shall be Suresh Kalmadi, for his impeccable record of integrity. Coming to the Amul ad/ topical on Mary Kom.It depicts the release of the biopic ‘Mary Kom’.The scene is a take on a poster of the movie showing Priyanka Chopra (PC) as Mary Kom, attired in a similar sports gear and throwing a punch.The Amul Girl is shown as a second or a sparring partner holding the punching bag and wearing protective gear .The movie has been critically acclaimed and is aSanjay Leela Bhansali production, directed by Omung Kumar. The Tag Line…Kombatant !… is a play on the name of MC Mary Kom and is a fitting expression for the boxer who has had to combat many a odd to reach the pinnacle of her sport.It also doubles up for denoting a fighter, which all boxers are. The Punch Line..Everybody’s Favourite Box..is a subtle hint for the not so discerning that the strip is about a Boxer and ofcourse endorses the primma donna status of the Amul Butter as being the favourite butter box for all! Before I sign off.A word for the “home minister” Onkohler-Mary Kom’s husband- Keep up the good work and you are as much an inspiration as your wife!!! Lastly,Alia Bhatt should represent India in boxing to avoid Sarita Devi type judging and refereeing controversies.A walkover is a better option for her opponents – better than being alone with her for four rounds!!!! And my title is tribute to the unbreakable spirit of Mary Kom who has recast the image of a “Bharatiya Nari”. The ver 5.1.1.1 – 5 World Championships, 1 Olympic Bronze Medal & 1 Asian Games Bronze & Gold Medal each! The movie needs a sequel…2016 Olympics…Mary Kom…Gold! A PERFECT HAPPY ENDING!!!! Previous PostMARS ORBITER MISSION: MANGALYAAN AND THE FOURTH ROCK FROM THE SUN !Next PostOMG! DEEPIKA PADUKONE & THE “DIRTY TIMES”! Good read….three cheers for Mary Kom and also to Priyanka Chopra and Alia Bhatt for their part to let Indians know about the grit, sacrifice and fearless attitude of Mary Kom. She is a true role model for all Indians- for how long will we keep falling the likes of Jayalalitha(who mercifully was awarded the Nobail prize by Karnataka High Court). As to Jisiki biwi boxer….uska bhi bada naam hai. 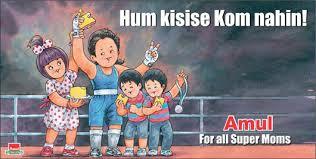 ..dushman ko pitwalo gondo ka kya kaam hai…Well done Mary Kom you make all Indians proud and well done Amul and Anshuman. .enjoyed! M C Mary Kom-a beffiting tribute to her sheer grit and determination.We all salute the Manipuri iron lady. Kejri will be slapped, not punched, as these days he is also heard saying-Matt maro chantta bar bar,mein bhi dilse kehta hoon-abki baar Modi sarkar. If Mary Kom be given the title of “iron lady”, then Rahul Gandhi should be the designated “iron punching bag”-for being repeatedly punched, yet not waking up in life! Lovely bouts in jail.A fantastic read. She along with the other sportswomen is waging a silent battle against the didacticism of the societal structure.Change is around the corner. I didn’t know it all started with punching a rickshaw driver 😊 she truly is inspirational…. Her story makes you realise that losers are always looking for excuses and winners have no other excuse but to win … As usual a very well written piece informative and entertaining … Looking forward to the book now ! Focus.Drive.Perseverence.Determination.Will power.Mind over Body- Mary Kom!!!! Full of new information about the true “Hero(ine)”. Great piece of writing as always.Keep on the good work. The more you try and delve into “Magnificent Mary”, the more her true virtues emerge.Mother to 3 kids,challenging background,dimunitive physical stature, yet a world beating champion in a bloody and bruising sport where its not about the punches you can throw but about how many you can take and yet remain standing!And she has been everything that a Champion epitomises. I dont know if i had been a woman wheter i would have been able to come back to win the Asian Games gold medal after delivering a third child, bloating to 75 kgs and having to fght a recent victorious young and hungry challenger.But Mary..you are truly great! Trailblazer in the real sense of the word! Keep up the support.its oxygen for the effort! MC Mary Kom-there’s so much for all of us to learn from you. You are a perfect example of rock solid determination, will power, motivation, focus in life and so much more. Thank you for sharing with us the interesting facts about her life. A very well written piece. Keep up the good work. These facts have been a revelation for me too.and are tremendously inspirational to say the least.thanks for the thumbs up! Thanks.it will soon be 6.1.1.1.1! Mary Kom, really good at her work.. (Mera Kaam)…A true example of Naari Shakti (literally)..A stellar example for any person who believes…in To Do….rather than just dreaming of ..To Be…An inspiration for all…hats off to her…and kudos to her better half/ best half to support her in achieving all that she has done…very well written. Definitely a role model in the true sense.And you are right about the spouse as well.The best part is that she has it in her “To do” it at the Rio Olympics.Which will involve even more blood,toil,sweat & sacrifice!! As a young boy I was fortunate to have my father tell me about the history of the world and about the events as they unfolded.This was based on what I would glean out of conversations,news papers and the dear ol' 9pm news on Doordarshan. Today I have a Son, Ayenesh,And I too want to be able to tell him about his queries especially about the times he grew up in. 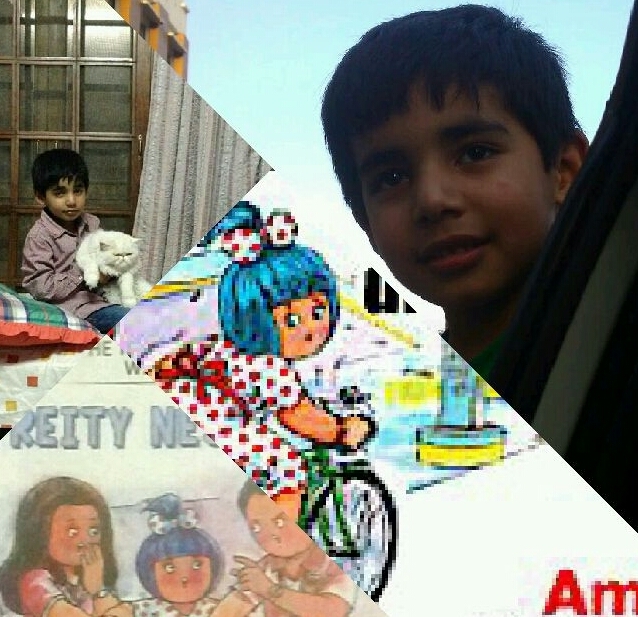 And my endeavour is being aided by the 'Amul Ad Campaign'. The topical issues covered in those innocuous cartoons are precious nuggets of history being created,while I am living through those events today! So,Ayenesh,this is for you my son.I don't want you to miss out on the events while you were busy growing up.I shall narrate to you what the ad portrays as and when it is featured. I have compiled my musings on the ads from 2012 onwards and here I intend to record my observations for the ones being featured now as well as attempt to hive the ones already reflected upon by way of careful jottings on the subject.Eventually when you grow up, you will have this Blog to fall back upon for your own private treasure trove of history, the basis for which would be the ads of a company which has butter as it's marquee product ! Wish you a wonderful life ahead and happy reading too. The views stated in the posts are my own and are based on the various articles posted on the internet and in no way represent the views or official line of the ad company or the Amul product line. The blog pictures are courtsey the official Amul Twitter account.